Visitors to Dubai will be able to get a glimpse into the life of an Emirati Bedouin with the launch of the new Al Marmoom Bedouin Experience. The project, operated by Platinum Heritage with support from Dubai's Department of Tourism & Commerce Marketing (Dubai Tourism), offers an engaging cultural experience for all the family, the excursion showcases the true essence of life in the desert, providing a fun, educational and immersive introduction to the Bedouin way of life. With options to visit during the morning to watch the sunrise or in the afternoon to enjoy the desert sunset, the experience explores Bedouin life across the days and the seasons. Guests will learn to saddle, ride and look after their own camel as they join a Bedouin caravan, travelling through the desert before they arrive at the camp. In addition to enjoying the traditional food and live cooking, local tour guides, who have graduated from the Dubai College of Tourism’s Emirati Tour Guide programme, will greet guests on arrival, before commencing on a tour of the camp, sharing tales along the way on how the Bedouin communities lived in days gone by. The camp is built around an oasis with the Bedouin village reflecting days of the past where Bedouins would go in search of sources of water to help them survive the arid nature of the desert. The village features a tent where guests can enjoy authentic meals and educational activities, a traditional goat enclosure, Bait Al Sha'ar (authentic Bedouin tents), and Al Hathira (a traditional building with a hollow interior where Bedouin traditionally hosted their guests). 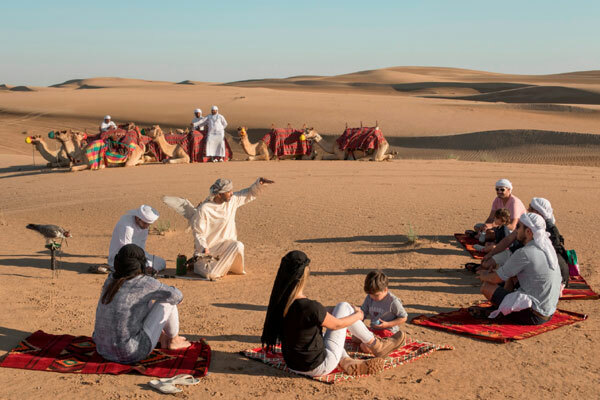 Offering a unique adventure, the experience displays the significant elements of life in the desert, taking travellers back in time to showcase the cultural origins of the emirate. Guests are invited to sit in storytelling circles with Bedouins to hear magical tales and snippets of wisdom about their culture and heritage. Additional elements include a falconry display and Emirati Crafts Tour showcasing the artistic flair from the nomadic community. Adam McEwan, CEO of Platinum Heritage said “Connecting to the local culture on a personal level is at the core of why most modern travellers choose to explore the world. Sharing an experience, living like a local and gaining an insight into the journey of the Emirati people into modernity is the essence of authenticity”.